The medical examiner reveals that poison is what did him in and Carrie feels responsible for having surged forward with the program despite pushback from her director. Driven by guilt, Carrie’s determined to discover who murdered the detective, convinced it’s the same man who killed Laura all those years ago. Luckily for Carrie, she has a friendly, knowledgeable ghost by her side. But as she questions the shadows surrounding Laura's case, disturbing secrets come to light and with each step Carrie takes, she gets closer to ending up like Al. Our protagonist Carrie has been living with her aunt and uncle and working as a library assistant, but is just about ready to move on until she's offered the position of head of programs and events at the local library. A voice inside her tells her she should stay (and it's not what you think!) and she immediately gets to work lining up a detective to speak about the unsolved murder of a woman (who also worked at the library) in her home 15 years ago. He claims to have information that will solve the case once and for all, but he drops dead at the event before he's able to reveal the evidence contained on his iPad, which conveniently goes missing. Carrie blames herself for the man's death since she's the one who arranged the event, and she teams up with the son of the woman who died over a decade ago to solve both murders. Carrie has additional help though, and that's where the fun comes in with the Haunted Library mystery series. The library’s resident ghost, Evelyn Havers, knew the original murder victim well and she's more than willing to lend her assistance from the afterlife since she has intimate knowledge of all the involved parties. Evelyn seems to have an interesting story herself, although it's not fully flushed out in Death Overdue. Her own death in the library parking lot seems rather suspicious to me. Carrie also has her hands full dealing with a jealous co-worker who wants her job (a fun character in spite of her vindictiveness! ), a romantic triangle in the works, and a precious little kitten she has her heart set on turning into a library cat. The ongoing activities at the library during the Halloween setting is the icing on the cake in an already delightful debut. Mudpie purred with excitement when I told her she could ask library cat Smokey Joe a pawful of questions. She hopes you enjoy the interview! Welcome, Smoky Joe! Thank you so much for taking time to chat with me today. Could you start by telling us a little about yourselves and how you came to meet Carrie? I was born on a farm on the other side of the woods from Carrie’s cottage. My three siblings, my mother and I lived in the barn with cows and goats and other cats. Some of the cats were pretty ferocious and would fight with us kittens when our mother was out hunting mice. I decided to set out on my own. Early one morning, before the sun rose, I wandered through the woods and came upon a cottage. I was hungry, but there were no mice to be seen. I meowed, hoping a human would hear me and give me food. Finally Carrie appeared. She opened the door to her car. She was leaving! I was so hungry, I dashed into her car. She gave me a piece of something I’d never tasted before. It was delicious! When we finally stopped and she opened the car door, I ran out into what I later knew was the library parking lot. Of course I had no idea where I was, so I didn’t struggle when she picked me up and carried me into the library. I sniffed around as we entered the building and liked what I smelled. I was home! Being a library cat must be so much fun! What's a typical day like for you? I absolutely LOOOOVE being a library cat. Every morning Carrie and I drive to the library from our cottage. The library is my second home. I’m free to go wherever I like. My favorite places are visiting the little kids in the children’s section and greeting people while they’re reading newspapers and magazines in the large reading room. Carrie has put up signs telling people not to feed me, but sometimes they do anyway. Lucky me! Do you think any kitty could be a library cat or does it take a unique purrsonality? I can imagine it must be quite upsetting if a patron doesn't want you around. Being a library cat isn’t as easy as you’d think. First of all, you have to really like people the way I do. I enjoy being petted, watching a patron smile as I approach. Of course not everyone wants my attention. I’m able to sense when someone doesn’t want to be bothered. It doesn’t hurt my feelings. I tell myself the person’s allergic to animals. Or he or she prefers dogs. Though once I heard one Carrie’s friends say that not everyone likes cats. 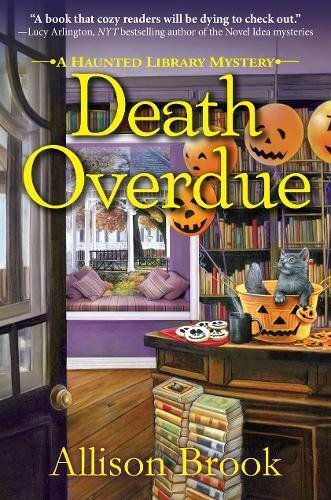 Tell us about Death Overdue, the first Haunted Library mystery you star in. My mistress Carrie got her job as Head of Programs and Events at the Clover Ridge Library about a month before we met. At her first program, a detective announced to his audience that he’d finally solved a cold case. He was asking questions about the victim, a local woman had been murdered in her home fifteen years ago, when he died. Turns out he was poisoned. Carrie felt awful. Since the police weren’t getting very far, she and the cold case victim’s younger son decided to solve the two murders. Carrie got some help from the library ghost, and she also had to spend time with the first victim’s family, which she didn’t always enjoy. But she discovered the murderer in the end. Have you had any ghostly encounters yet? You're just a baby...was it scary? I have not had any ghostly encounters and hope I never will. Carrie and her little cousin are the only people who can see Evelyn, the library ghost. I can’t see Evelyn but I know when she’s close by. She gives off this creepy, icy feeling that makes me hiss and jump around. I wish Evelyn would keep far away from Carrie. Can you give us any clues as to what's next for you and Carrie? In the next book, READ AND GONE, Carrie’s father comes to stay with us. Carrie’s not happy about this because he wants her to do something illegal—which of course she won’t. A bag of gems is missing, and everyone’s trying to find them as people are being murdered. I’m proud to say I play a big part in READ AND GONE. 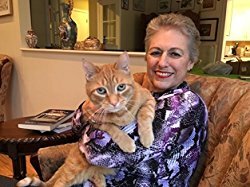 About the author: Allison Brook is the pseudonym for Marilyn Levinson, who writes mysteries, romantic suspense and novels for kids. She lives on Long Island and enjoys traveling, reading, watching foreign films, doing Sudoku and dining out. She especially loves to visit with her grandchildren on FaceTime. Oh, this sounds like a book I can't wait to read. I just love spooky fun books, and those set at Halloween, and of course those with adorable kitty characters like Smokey Joe! 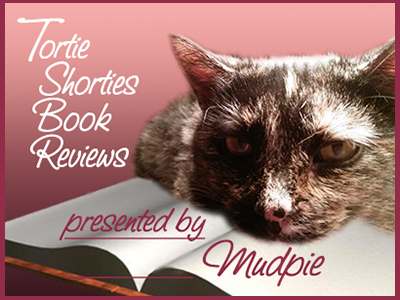 Sounds like a neat book and we really liked the interview with Smokey Joe! Thanks, Melissa and Mudpie! Sounds interesting. This book sounds great.....and I enjoyed the interview with Smokey Joe! Another one to add to my must read list. 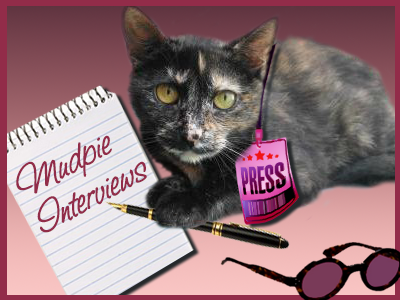 Great interview, Mudpie! What a terrific interview and great review!!! I'm so glad that DEATH OVERDUE sounds like your cup of tea! It was a fun book to write. Smoky Joe was happy to tell readers about himself. He's become quite the social butterfly. Smoky Joe and I both thank you, too. Smoky Joe adores his fans. I hope you enjoy reading DEATH OVERDUE! I've really been looking forward to reading this since I first saw it promoted. Thank you so much for the chance to win a copy!! Great interview Miss Mudpie. This looks like a good book.